A couple of weeks ago I noticed a new gelato place, named Grom, had opened up on 76th & Broadway next to Lush, and I thought to myself, fabulous! Next time I had my camera in tow, I’d stop by. This past weekend, when The Drama Teacher came to visit and go to shows, I told her I knew the perfect place for an afternoon treat, and so we went. The weather was wonderful, not too hot and not too cool, so we strolled up through Central Park and then cut over to Broadway on New York’s Upper West Side. We arrived at 12:30, with just enough time to eat a yummy treat and then book it down to the Theatre District in time to catch a matinee. The staff was friendly and helpful, the décor clean and contemporary. 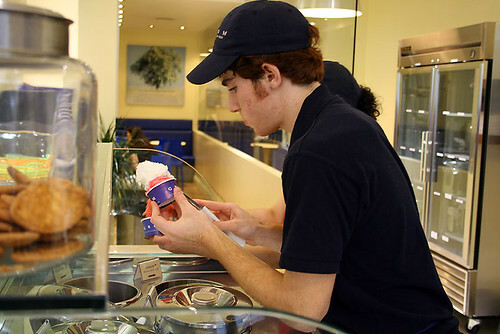 All of the flavors looked wonderful; I decided to go for something light and refreshing, so I chose to get ½ raspberry and ½ lemon sorbet. The Drama Teacher went for the pistachio gelato. With bits of pistachio and creamy goodness The Drama Teacher said she’d get it again and gave it three thumbs up. She asked Grom about the brownish-green color, and was told that since they don’t use artificial coloring it wasn't greener. After snapping a few photos, we strolled down Broadway while eating our frozen treats. The lemon sorbet had a refreshing crisp tartness that was just sweet enough to keep a look of bliss on my face, and a pucker far, far away. 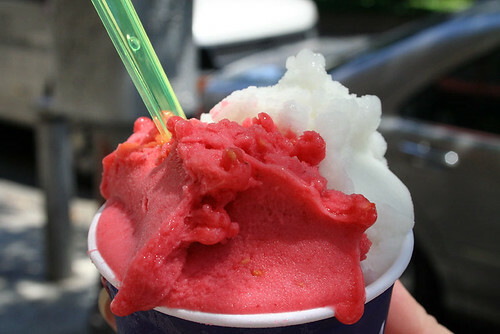 From the first bite of raspberry sorbet to the last, I felt like freshly picked raspberries were bursting in my mouth. The flavor was so delightful; it reminded me of picking raspberries as a child. For those of you who were lucky enough to have a raspberry bush in your back yard or a ‘pick-your-own’ raspberry patch nearby, you’ll know what I’m talking about. Worried that my photos might not have turned out, and maybe just a little bit interested in trying out the flavors once again (quality control, I’m sure) I headed back to Grom for a second time. This time the line was just a little bit longer. Incidentally, I don’t think the line is always this long, so don’t worry, just come. 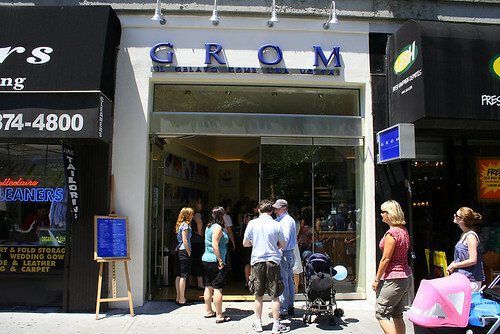 In the past few weeks while Grom’s been open, I’ve passed their storefront several times and not seen long lines. I think the fact that I snapped this photo on a weekend evening after a hot and steamy summer afternoon had something to do with the line’s length. The lemon and raspberry sorbets were just as good as I remembered, and the chocolate gelato was divine. Rich and creamy, I felt decadent just letting it melt in my mouth. Simply remembering about the chocolate gelato makes me realize that with Grom being a hop, skip, and a jump away from work, it’s going to be torture to not run over there everyday at lunch. 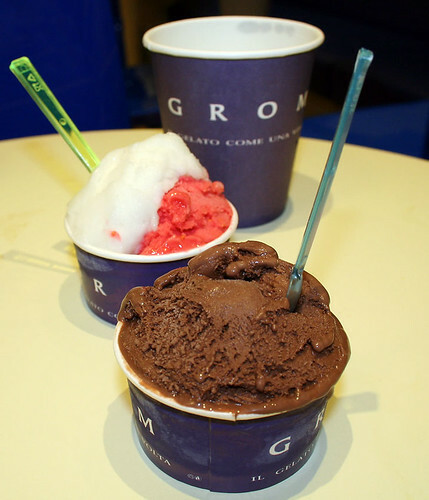 If you happen to stop by Grom, report back and let us know what you ate and how it tasted. Watch what the Today Show has to say about them, or read about them in the Gothamist or the NY Times. We rolled out there a few weeks back. I had a lemon/yogurt mix, which was excellent. I think it's way, way, way over-hyped but it's good gelato either way. I didn't realize there was so much publicity until I searched for their URL to link it to this post. Lemon/yogurt, Mmmmm, next time I go, I'll give it a whirl. 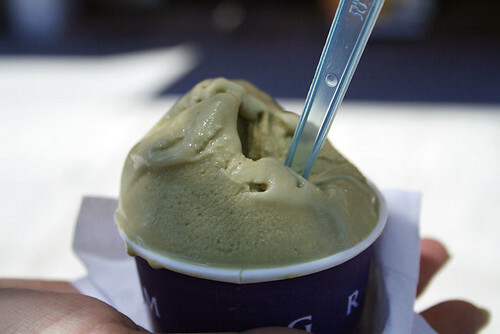 We ate lots of Gelatto this spring in Italy. 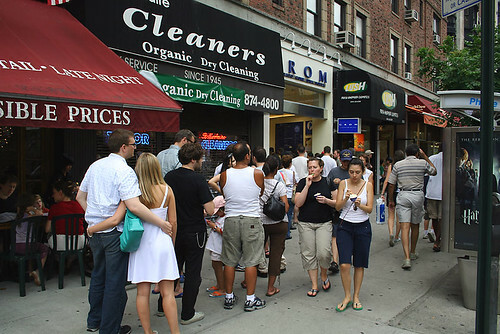 I've walked by many times and there has always, always a line down the sidewalk!!!! I've been wondering what that place was. I work at one of the local media outlets responsible for all the hype. I think it's been featured 2 or 3 times in this publication now. lol, and the disclosure comes out. So do you think that there were a few editors and writers who loved the place, or is there just one person who keeps asking for more stories? You know, I'm not sure. We tend to follow the buzz as much as we create it so it was likely a bit of a vicious cycle (maybe that's a bit of an exaggeration). It got a mention when it opened and then warranted another one because of the crowds and then got yet another mention in a feature on chain restaurants. Not sure if it's showed up more than that since then but I'd be surprised if it didn't. Robert: Thanks for the explanation! It makes total sense. Donna: Ah Italy, one day I'm going to actually take a trip to Italy and Greece...in the meantime, you don't mind if I live vicariously through you too, do you?